Needing a desert to bring to a barbecue, I adapted this recipe to use up ingredients available in my pantry while the baby napped: a few packages of graham crackers, half a package of marshmallows, only 1-1/2 cups of granulated sugar, and King Arthur cocoa powder. With a S’mores Layer Cake and S’mores Bites, I think I have completed the round of S’mores recipes for awhile. Grind graham crackers in a food processor or by rolling crackers inside a sealed plastic bag. Add 1/4 cup granulated sugar to the crushed crackers and mix in a medium bowl. Melt 6 Tbsp. of butter and add to the crushed crackers and sugar, stirring to combine. Press mixture into a pie pan and place in the refrigerator while preparing the brownie. Preheat oven to 350 degrees-F. In a double-boiler, melt remaining 10 Tbsp. butter, remaining 1-1/4 cups sugar with cocoa powder and whisk to combine. Remove from heat and add eggs one at a time, thoroughly incorporating. Add salt, vanilla extract, and flour, stir to combine. Pour brownie batter into prepared crust and bake for 25 minutes. 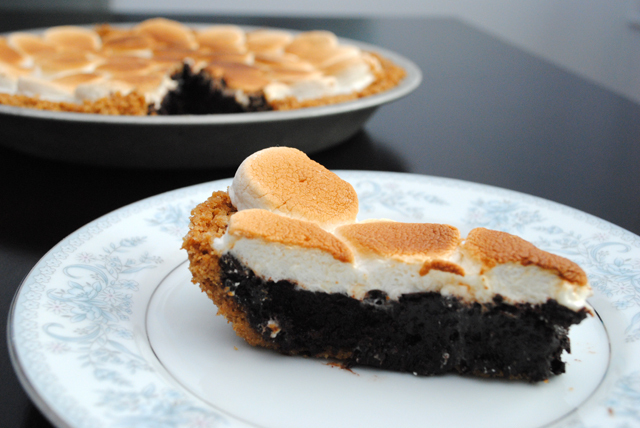 Cut marshmallows in half and place cut side down on the baked brownie. Return to oven for 4 minutes. Turn on broiler and place pie a few inches from the flame. Watch closely and toast marshmallows for 2 or 3 minutes, turning the pan to brown evenly. Let cool completely in pan at room temperature. Use a sharp knife dipped in water to slice so the marshmallows do not stick to the knife. Can’t wait to make this pie! I was given some FRESH, HOMEMADE Marshmallows by a friend of mine, so I’ll use them for the topping. There is just no comparison between bagged/store-bought and fresh marshmallows. Thank you! What do I do after it’s come to room temp and my guest don’t consume the entire pie? Refrigerate? I stored it at room temperature but would be sure it was eaten by the second day. The crust will get soft over time. Leftovers weren’t an issue in our house.